A picture says a thousand words - what else can we say about this showstopper Raspberry Pavlova dessert. 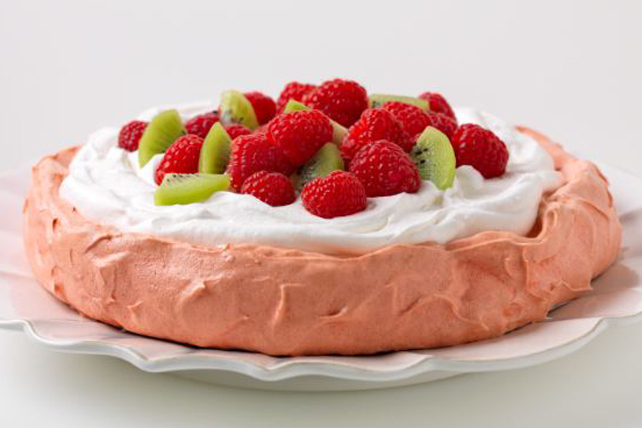 This fruit and meringue dessert tastes as good as it looks, that's for sure! Combine sugar and dry jelly powder. Beat egg whites in medium bowl with mixer on high speed 5 min. or until soft peaks form. Add sugar mixture, 1 Tbsp. at a time, beating constantly until stiff peaks form. Gently stir in lemon juice and corn starch until blended. Spread into 8-inch circle on parchment-covered baking sheet. Bake 1-1/2 hours. Cool completely. For best results, egg whites should be at room temperature for maximum volume. Prepare meringue on a cool dry day. High humidity can result in a chewy sticky meringue. Substitute any berries, such as strawberries or blueberries, for the raspberries. Prepare using 1 pkg. (10.1 g) Jell-O No Sugar Added Raspberry Jelly Powder and Cool Whip Light Whipped Topping.